They were just fabulous! All 340 pairs of them, swinging gently in the Auction Mart and showing off the talent and generosity of so many knitters. 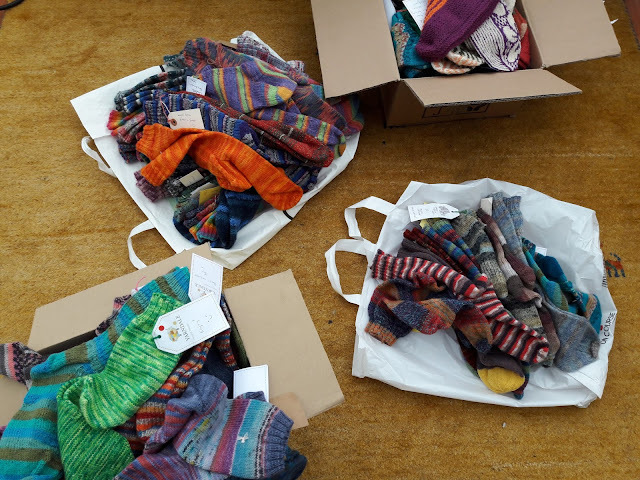 Over 100 more pairs came in during the Yarndale weekend to make up the total, and everybody who came in to the Knit n Natter lounge to see them was very impressed. I was very impressed that the washing line holding them up didn't break! Back home, it took me a week or so to recover from the excitement of Yarndale and then it was time to start thinking about rehoming the socks. 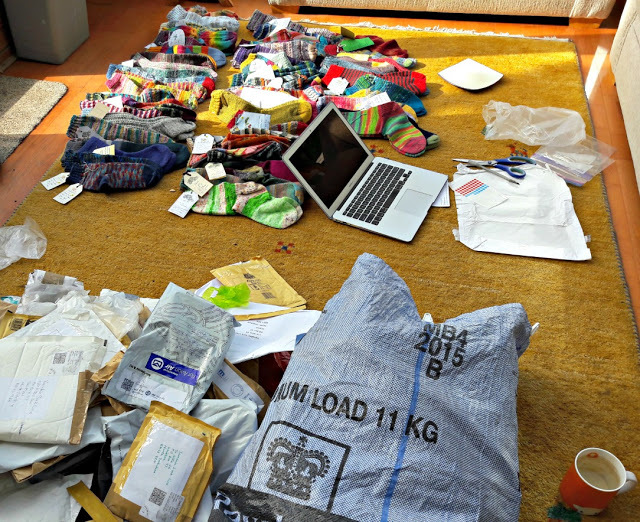 I like to send the socks to different places every year and am always looking for suggestions for places or organisations that might like them. Surprisingly, they tend not to be the big charities who don't have time to distribute pairs of socks, and it's not possible for me to hand all the pairs of socks out individually to homeless people and not just because I can't be everywhere - people are homeless for all kinds of reasons and some don't like to be approached; rough sleepers don't want to attract attention with brightly coloured socks and I'd have no way of knowing what size would be appropriate and I couldn't carry them all - so the practicalities of doing that mean that it's always better to give them to an organisation that is specifically geared up to knowing how best to distribute them. I had more suggestions than ever this year, which was great as I had more socks than ever to give away. 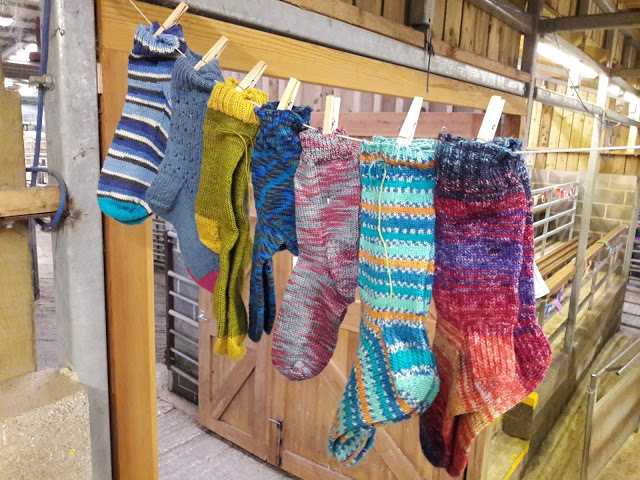 Some of the places I phoned didn't want them, which might sound odd given that those of us who love our hand knit socks couldn't ever imagine anyone turning them down, but they had their reasons and it was good to have more places on the list to call instead. I've listed all of them on a separate page, along with the names of the knitters whose socks have gone to those organisations. You can find that page here. and they've all been received at their new homes now. 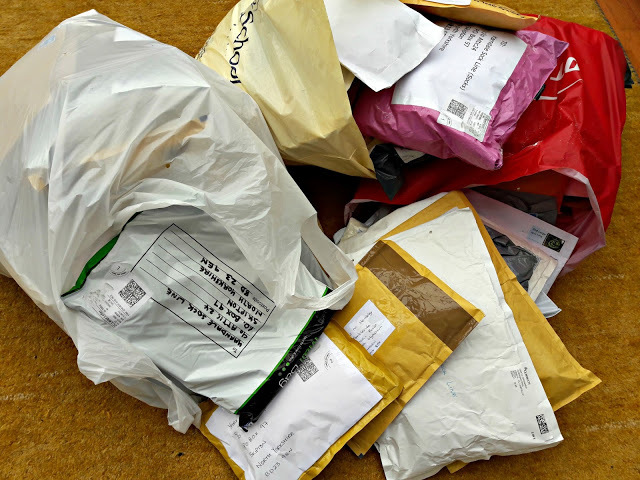 They've gone to more organisations than ever this year which has been really lovely; you should know that all those hours that you spent knitting and the words that you wrote on the tags have made a difference to someone and you should feel very proud. 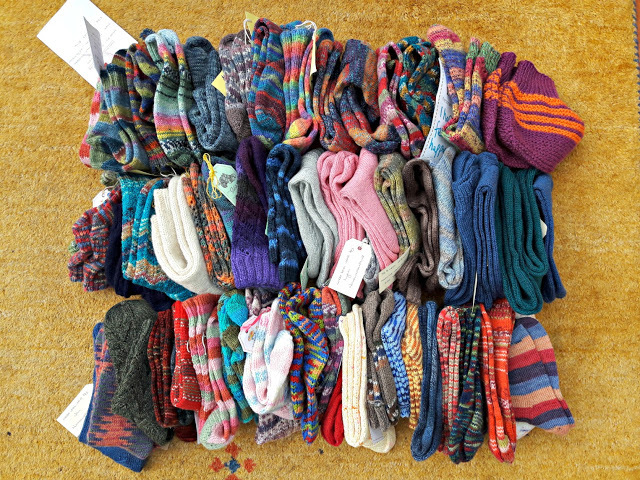 Thank you so much to everyone who got involved with this year's Yarndale Sock Line. 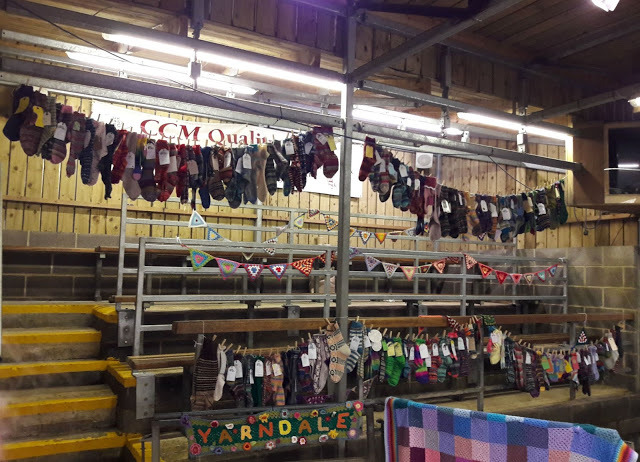 It's been a huge success once again and - I think - embodies Yarndale's mission to bring creativity and community together in a really wonderful way. 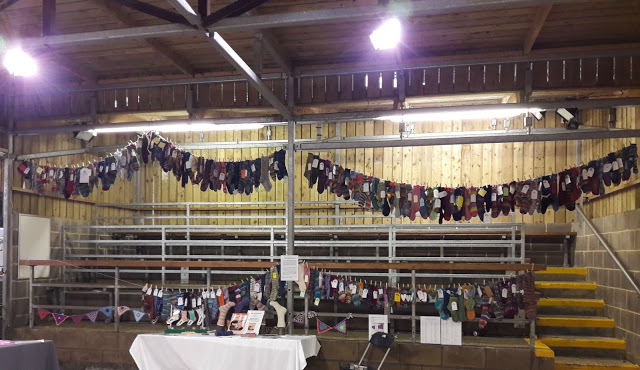 Many congratulations on organising such a well supported and worthwhile event, I know that each of those 340 pairs of socks will bring a little comfort and happiness to those 340 recipients. 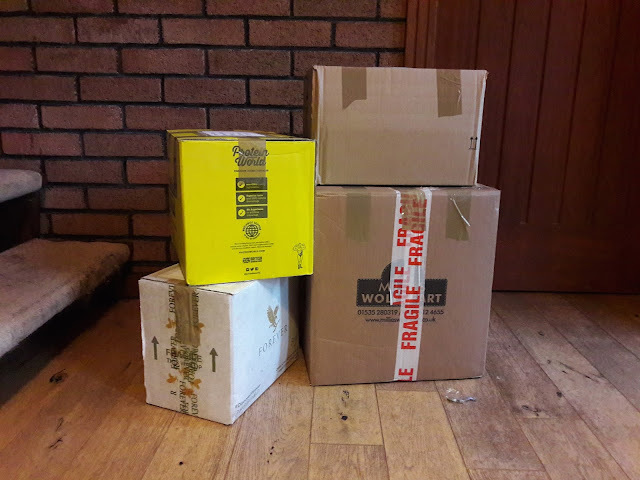 I always enjoy reading this post each year, telling us of the places where the socks have gone and I'm especially thrilled this year to find my own pair of socks have winged their way to Victoria Care Home in Rainford as they'll be on the feet of a resident with dementia, and as my own mum is suffering from this horrible thing, it's something which is close to my heart. Thank you for all the time you take to organise this. Shall be doing a pair for nest year. Only started knitting socks this year and didn't want to inflict my newly acquired skills on someone other than my family! what a wonderful project you have co-ordinated. well done . \t takes a lot of work to get it sorted. I ended up getting behind with socks I intended for you. Can I just post them to you anyway in the new year? My second attempt at posting. The Sock Line is amazing and is a treat to see and it is all thanks to you. You've created a wonderful warm woolly giving experience and taken on hours of work both before and after Yarndale. You are fabulous! 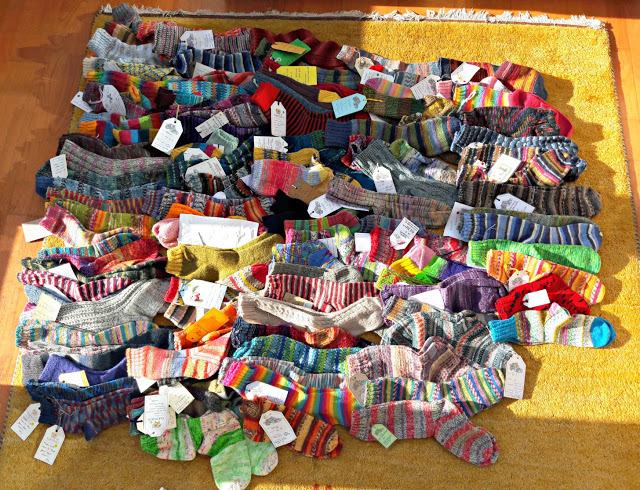 Such a lot of wonderful sock knitters who took part. It was lovely to see my name amongst them.